All transactions are safe and secure with a reliable history in online purchasing behind each of our associates. 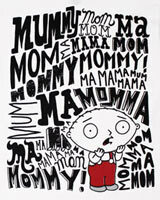 Buy the Stewie Mom Mommy Mama t-shirt to own Family Guy clothing and merchandise. This popular tee features a freakin' sweet cartoon style image of Stewie and the familiar quote that he repeats in various forms as he calls out for his "mommy" over and over. The Stewie Griffin quote is also played during a TBS advert for the series. After his mommy finally stops what she's doing to angrily acknowledge him, he simply says, "Hi." Stewie would approve of the funny quote on this freakin' sweet Family Guy t-shirt. In addition to the Stewie Mom Mommy Mama tee above, browse the Family Guy Clothing Gallery for more apparel like men's and women's clothes, kids shirts or hoodies.